We all can get a little lazy relying on the frameworks that have arisen due to the monetization of offensive skills. In light of this, I wanted to make a short post to inspire people to explore what can still be done by rubbing two sticks together in a shell. TL;DR - The command line. Use it more, and harder. There are thousands of command line tips, tricks, and hacks. I'll toss out a few examples I've used in the last month to get your creativity flowing. A simple reverse shell using fifos and openssl s_client. There's a great deal you can do with this tool, take a look at the server options. There are plenty of ways (pipes) to resurrect good old netcat, but have you ever looked inside of the nc applet in BusyBox? [-e PROG] is still a valid argument. Ever browse the source of some of the tools on your box? Here's a little cgi shell using the httpd applet in BusyBox. Our backdoor is in the base64 above, and looks like the following. Maybe we want to restrict access by HTTP method or user agent? We can utilize the env vars passed to the httpd. Might as well clean up after ourselves while we are at it. Now whip up a quick loop on our controlling host that meets our triggers. Need our httpd cgi shell encrypted? Why not toss some RSA keys into variables via file pipes. To get around key to data size issues, (and be more correct) use these to handle symmetric keys. I'll leave exact implementation up to you. The point of this post is to inspire ideas, get tinkering! last and history tell us a user logs on frequently and uses the sudo command. We could use LD_PRELOAD... or simply wrap sudo in a argument expanding function. We force a sudo timeout, fake an incorrect password entry, send the password encrypted to our server, then issue the user's original command by expanding their arguments. Why bother cracking a password when you can have a user type it for you? This can also be done with an alias. Which can be hidden with control characters (think ^M). Need to know what a user is typing in their tty? Note: We follow forks with -f in order to grab subprocess and sudo password input. Don't want the user to see your sudo wrapper, a command, or specific argument? There are dozens of ways to avoid logging with escapes and sub-shells (mail, gdb, ash). But what about creating a pipe of standard in? How could you further hide the process with shell wrappers, aliases, symlinks, exec renames? What I'm getting at here is, never underestimate the power of leveraging built-in tools in unintended ways. For me, this style of thinking is the true sense of "hacking." Learning about an environment or system until you understand what you can make it do, irrespective of what it was intended to do. Next time you look at a system, environment, or command, ask yourself the following. Does it: create sockets, alter data, read files, elevate privileges, control the flow of data, alter appearances to a user or process, impact commands before or after execution, alter keyboard entry, import anything from anywhere... ? The list and impact is only limited by your creativity. Enough soap-boxing, have a fun time in Las Vegas! Be safe. A few weekends ago I was working through exercises from the folks at Offensive Security when the VPN connection died. ifconfig told me that the tap interface was down, out of habit I fired off netstat to see what other connections were established, something strange stood out. There was a root-owned process listening in the Registered Ports range, the port number didn't ring a bell. 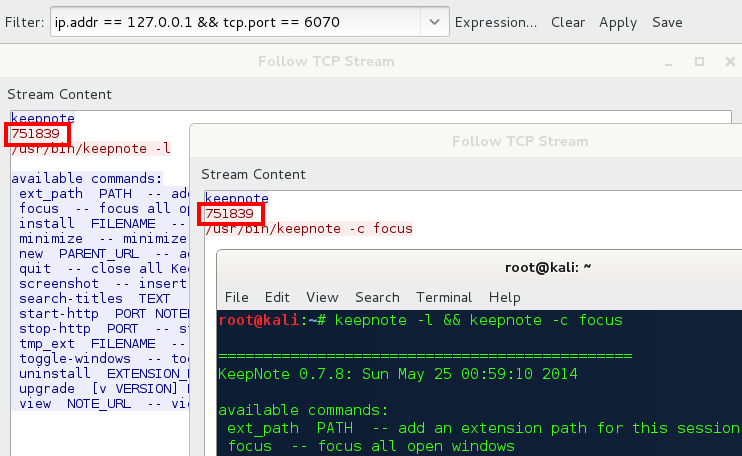 Digging deeper with lsof, the process turned out to be KeepNote, an open source tool used by OffSec students and pentesters alike to organize their notes. This is the story of how that netstat became a root shell. The first step in our exploration is figuring out exactly what traffic goes over this socket. The KeepNote help menu hints of an interprocess command functionality present in the software. Watching the IPC in action we discover a clear-text protocol with an unknown numeric string common across sessions. To test whether this string plays a role in authentication and or authorization, we replay the session via a raw socket. The numeric string appears to be the sole authentication mechanism in the protocol, let's track down how it is created. Just how feasible it is to brute force this pin, and what controls are in place? For this we search for instances of the socket listen and accept methods. Note: Here we discover the port is randomized on process startup. We have a listen backlog of 1, however, the manner in which connections are accepted in no way prevents brute forcing the pin. Use of the loopback interface lends additional advantage in the form of a speed increase, and elimination of the need to carefully handle timeouts. Port randomization in open_socket() forces us to create a means by which to reliably map the PID to a PORT number. Many of you will shout: netstat, lsof, ss, ps, fuser! If you explore these solutions you’ll find the -p flag and process to socket information is not available to non-privileged users. We grep /proc for potential representations of the port number and find hex representing the socket pair present in /proc/<pid>/net/tcp. We are able to leverage state information in the file to further identify the socket. From the enum in tcp_states.h we know 0A represents a TCP_LISTEN state. We now have everything we need to discover, map, and crack the IPC pin. Onward to code execution! After some exploration, leveraging extension installation functionality seems the most likely path to execution of code. Investigation of the extension format reveals they are zipped archives containing an informational XML file and the Python code for the extension. Reviewing the code, there appears to be an "Extension" class inherited from keepnote.gui.extension.Extension, we choose this as our target for execution. By poisoning the __init__ method of this class, we can gain execution when an instance of the class is created. Importantly, we do so with low likelihood of disrupting normal execution flow. Digging for alternate ways to instantiate an extension, we find on_temp_extension(). 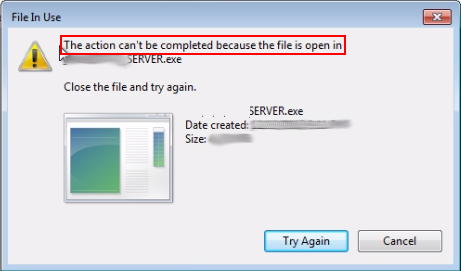 This function initializes a single session extension instance without user interaction. It lacks functionality to unpack our archive, so we'll need to extract the extension contents ourselves. We now have everything we need to escalate privileges on the system. 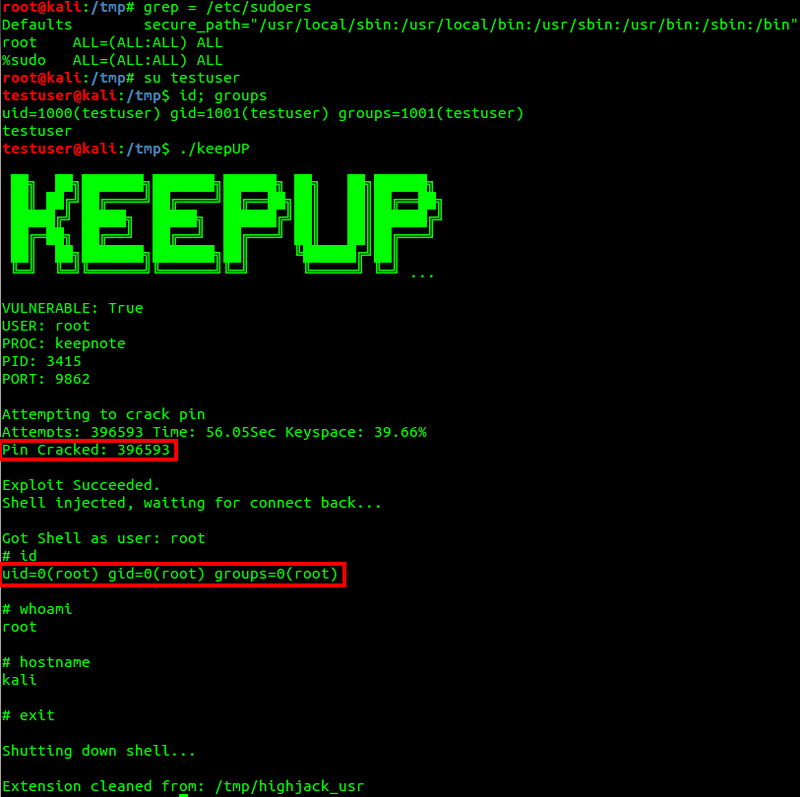 In order to mitigate this attack, I recommend starting KeepNote with the --newproc flag. Use of this flag will prevent the command socket from being created. As the project does not appear to be under active development, and exposure to this vulnerability is rather low, turning off the IPC socket will be an acceptable mitigation for most users. I have contacted the primary author of the project out of courtesy. Note, this blog is in no way a commentary on the competency of the authors of the project, many of whom I'm certain are more capable developers than myself; thanks for the great software folks! Note: I've also written a threaded version of this POC, however, under Python 2.7. * the GIL drastically impacts the speed of the attack. A speed increase can be had by leveraging taskset to force process affinity to one core, however, if speed is a major concern, C is the answer. Hijacking the KeepNote IPC socket to execute arbitrary code. In order to demonstrate this vulnerability, we create a user with no privileged group membership or sudoer privileges. We then use this account to exploit the IPC socket, gaining a root shell. We can now hijack any account with an exposed KeepNote IPC socket.